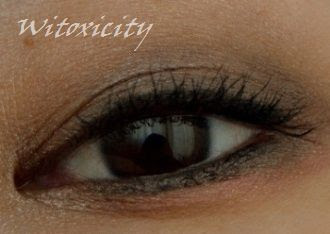 It's time for another eye look using two of the eyeshadow soufflés from the Catrice Hidden World collection. 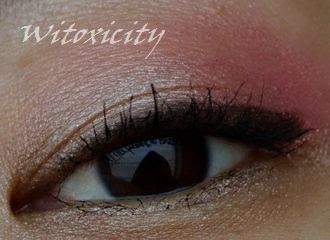 It's a light and easy look with simply pink, champagne and a hint of dark brown. 1. 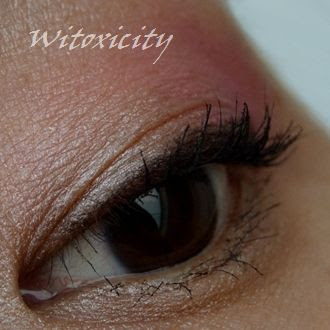 Pink on the outer half and lightly on the crease. 2. Champagne on the inner half, inner corner and on brow bone. 3. 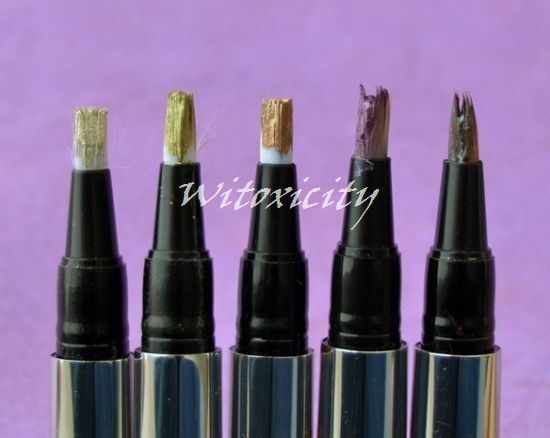 Lined and tightlined with the dark brown eyeliner pencil. 4. Applied the champagne colour along the lashline. 5. Curled lashes and applied two coats of mascara. 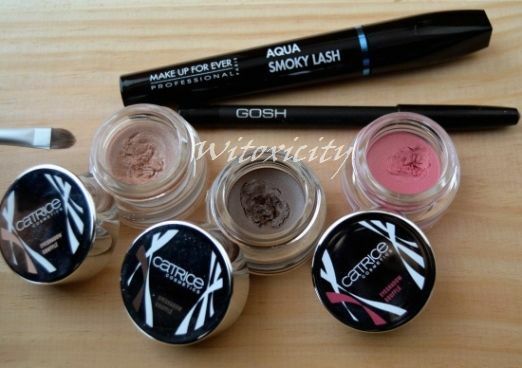 Here, I used mainly my fingers to apply the eyeshadows - application is quicker and it's easier to smudge out the edges. 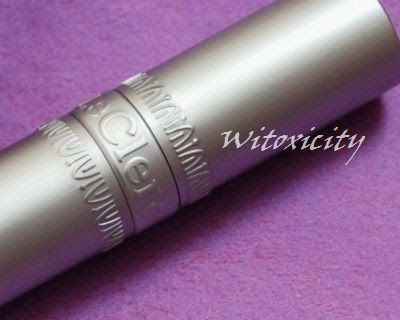 Reminder: Try your luck in the Catrice Hidden World Giveaway which features two eyeshadow soufflés and other goodies from this collection. 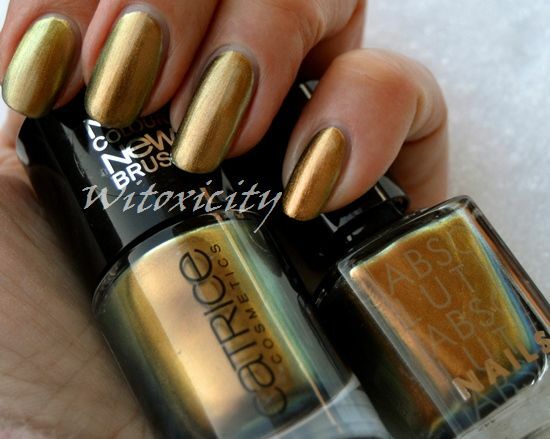 This polish is one of three polishes that belong to the Catrice Hidden World collection. I indicated before that it is a collection of rather muted colours. 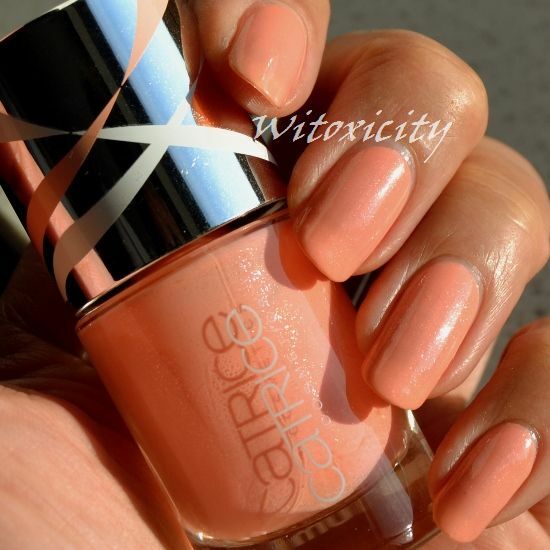 Catrice Walk On Air is a sweet one. 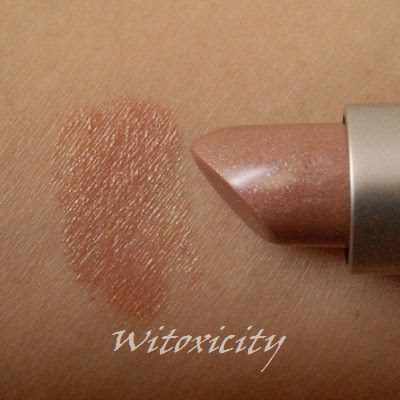 It's a pale milky peach-pink with very subtle pinkish shimmers. 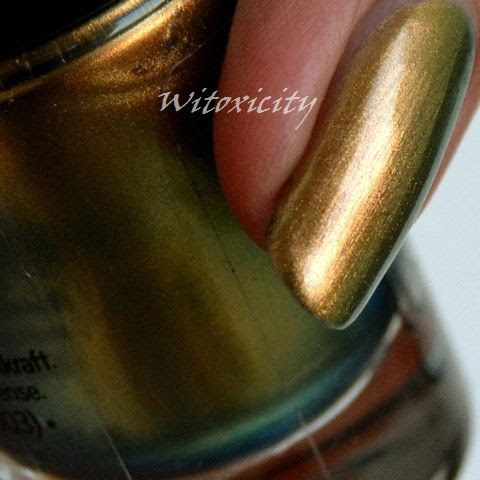 It has a sheer formula and after four coats, the nail line is still visible (which I don't mind nowadays). 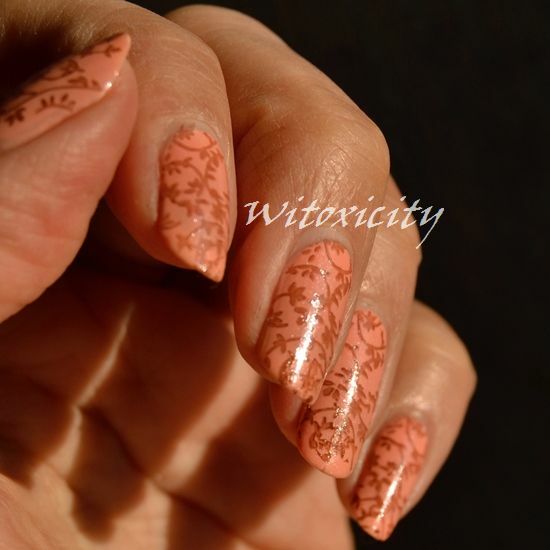 I took out my Chez Delaney plate H28 and stamped the full-nail viney design on Walk On Air using a brown KONAD stamping polish. 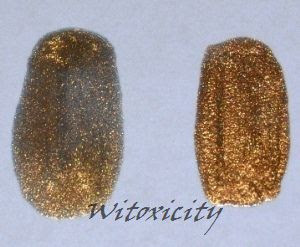 Because of the different colour scheme, the effect is quite different from when I did the same stamping with gold on Sparitual Epicurean. 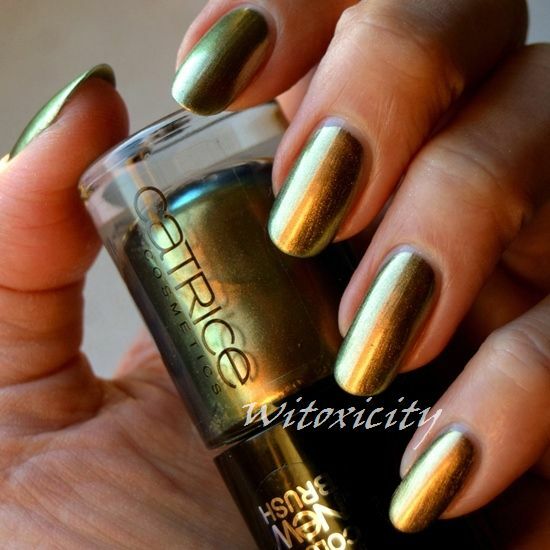 Reminder: Don't miss the Catrice Hidden World Giveaway which features this polish, amongst other things. It ends in a few days. 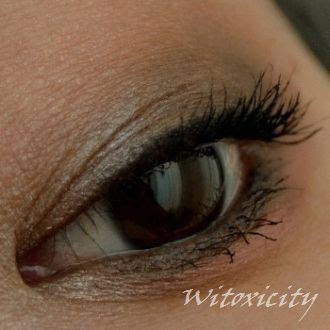 Here's another eye look using the Catrice Hidden World Eyeshadow Soufflés. The first one I did was mainly a fresh pink look and this time around, it's a neutral go-anywhere-brown look with a hint of champagne and pink. 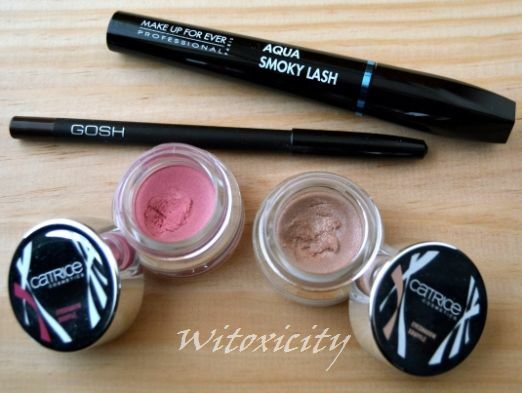 I usually prefer to use my fingers to apply but for this look, I made use of my small flat (synthetic) brush. 1. 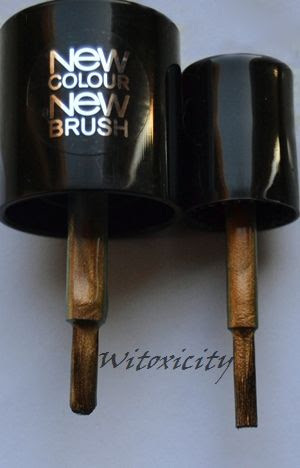 Dark brown on the lid, except for the inner corners. 2. Champagne on the inner corners. 3. Lined and tightlined with the black eyeliner pencil. 4. Applied the pink soufflé on the outer three-quarters. 5. 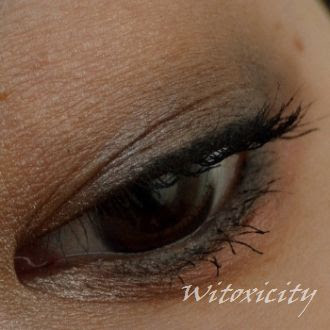 Lined the lower lash line with the dark brown soufflé. 6. Dabbed on the champagne on the inner sections. 7. Used the black eyeliner pencil on the waterline. 8. Curled lashes and applied two coats of mascara. Done! 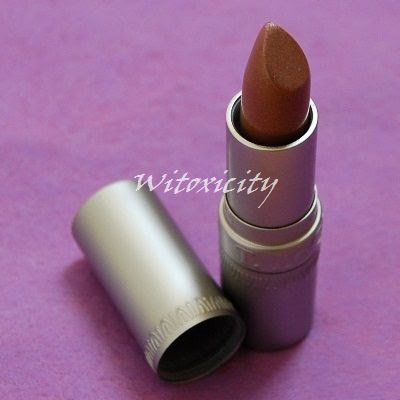 It's earthy with a flirt of pink. Don't forget to take part in my current Catrice Hidden World Giveaway which features two of these eyeshadow soufflés, amongst other things. 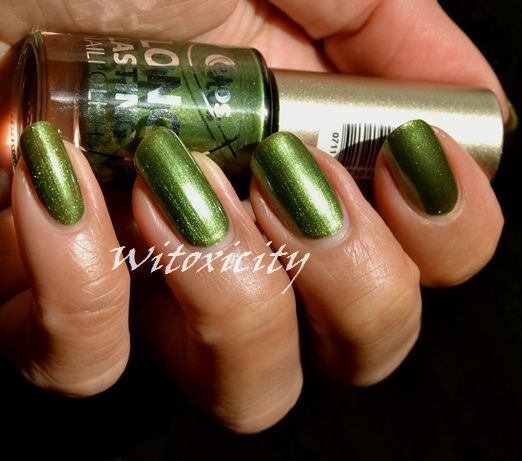 Before I go back to writing about non-nail polish products, I'd just like to do this quick feature on a simple lime green shimmer polish by Etos, a Dutch drugstore chain. 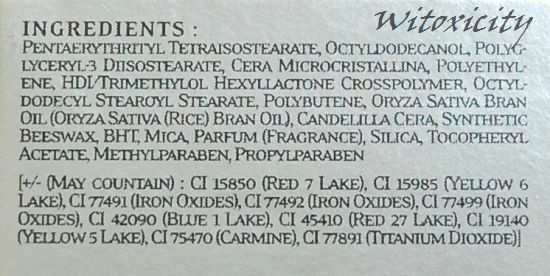 Etos Long Lasting Nail Polish No. 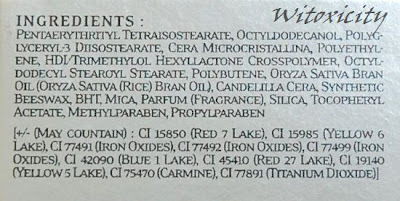 22 has a sheer formula and required at least three coats. I stamped this design from one of the Essence Nail Art Stampy Design plates (it's the one with also a peace symbol and an anchor) with a yellow KONAD stamping polish. 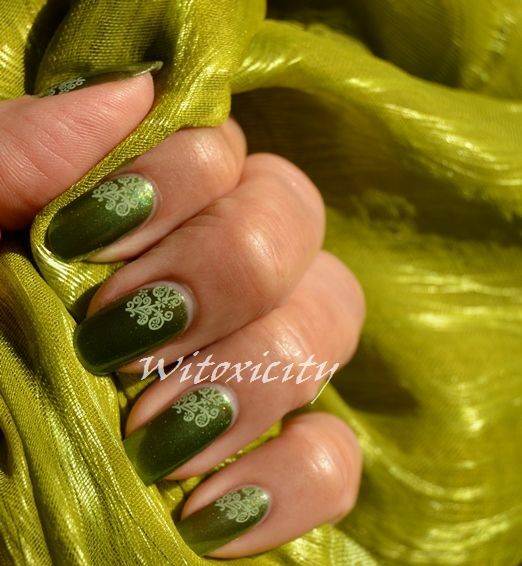 The stamped design is best viewed at an angle, without the shimmer shine. The flowy material I'm holding is a Cambodian silk scarf that my very dear friend, Pat, got me a few years ago. I absolutely love the scarf. 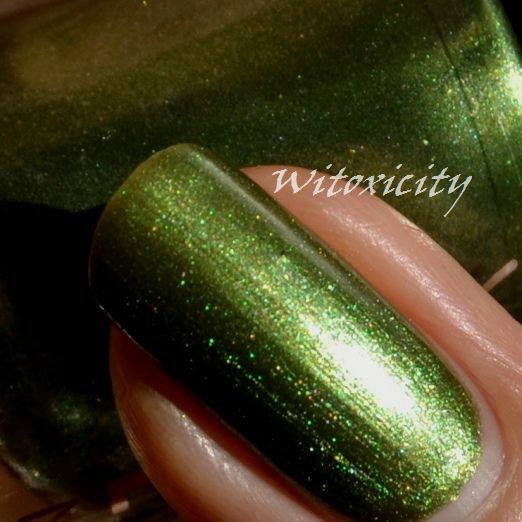 Reminder: Win this polish in my current giveaway. Ends very soon. Douglas Maria 09. 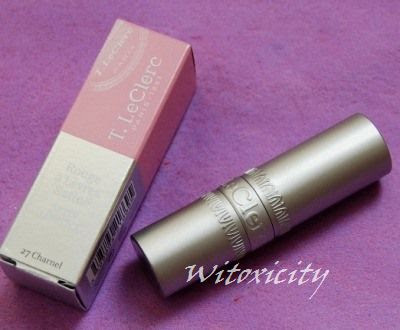 Ooh, another possible dupe for Chanel? 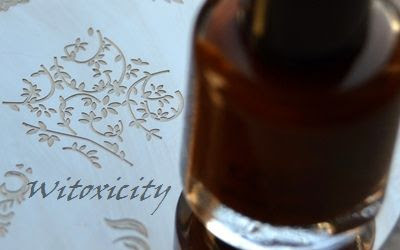 Paradoxal perhaps? 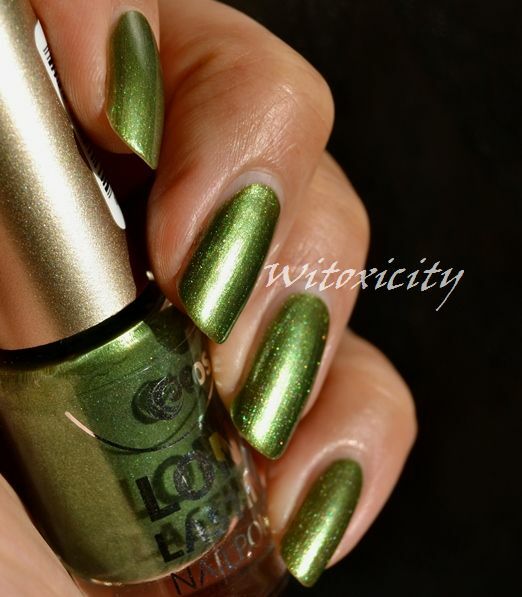 I featured Douglas Fireworks a couple of weeks ago and that one seemed to bear a strong resemblance to Chanel Peridot. This current polish, Maria, is a creamy dark purple taupe with pretty, shy shimmers. 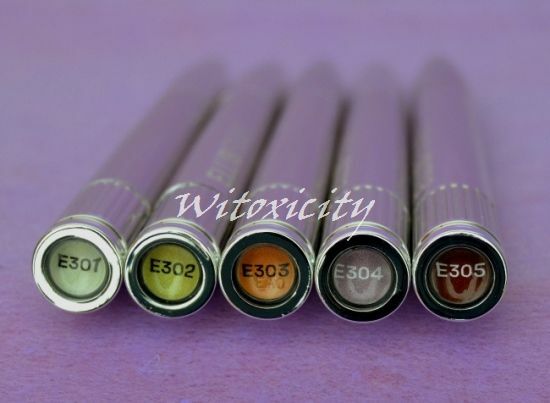 The shimmers are predominantly purple/pink but they do twinkle blue, green and red sometimes. The shimmers are subtle though, only noticeable in very strong lighting. 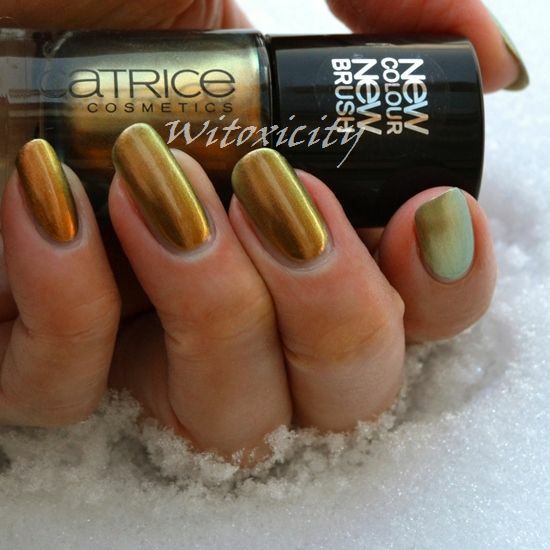 Maria applied beautifully and needed only two coats. Douglas, a German parfumerie chain, launched its own range of nail polishes called Absolute Nails not too long ago. I believe Maria 09 belongs to the main collection. 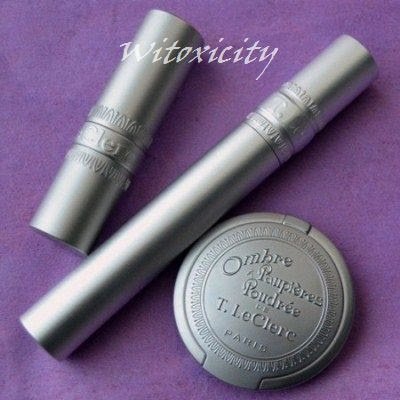 Retail price: €4.95 (11ml). The bottles come with double caps.